August 2017 20 www.sportseventsmagazine.com Long before competitions were held in man-made structures, people created contests wherever they found space. Some of the most physically challenging athletic matches often happen in natural settings where streams and rocky pas- sages or high surf and frigid tempera- tures present obstacles that make an more ordinary challenge into something extraordinary. A community may not always have the money to build an athletic facility to host organized sports but almost every area has some form of outdoor space where a signature event can emerge. 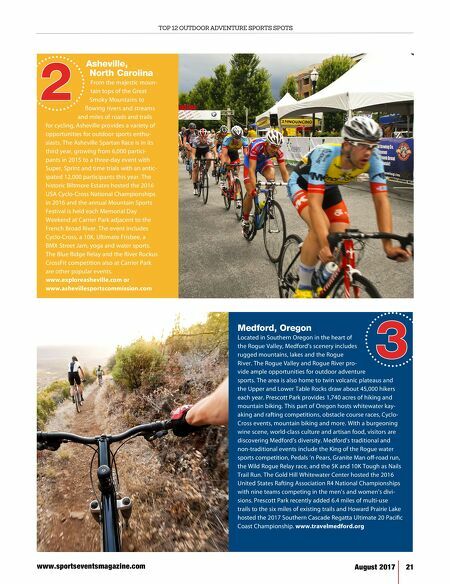 We recently researched hundreds of destinations that host outdoor adventure competitions and asked our social media friends to choose from a field of 25 outdoor spots that are known for their adrenaline-pumping adventure sports. Our Facebook post got a great response with 68,447 people generating 2,356 votes, shares, likes and comments to select the Top 12. TOP 12 San Marcos, Texas With more than 1,200 acres of parks, including trails for hiking and biking and riverfront access, San Marcos hosts adventure sports events such as the Purgatory Trail Run, the GOODE Water Ski National Championships, the Kayak Polo Nationals, the River Bassin' Kayak Fishing Tournament and the Texas Water Safari. The San Marcos River plays a large role in sports activities. The river is fed from hundreds of springs in town, keeping the water temperature at 72 degrees for year-round kayaking, stand-up paddle boarding (SUP) and swimming. The GOODE Championships draws more than 800 participants and 1,600 spectators to the San Marcos River Ranch in Martindale each year. San Marcos is also home to the Texas Water Safari, the World's Toughest Canoe Race. The 260-mile race travels down whitewater rapids via the San Marcos and Guadalupe Rivers from Aquarena Springs in San Marcos to Seadrift on the Gulf of Mexico. The Texas Water Safari attracts 150 boats and participants and 200 spectators annually. 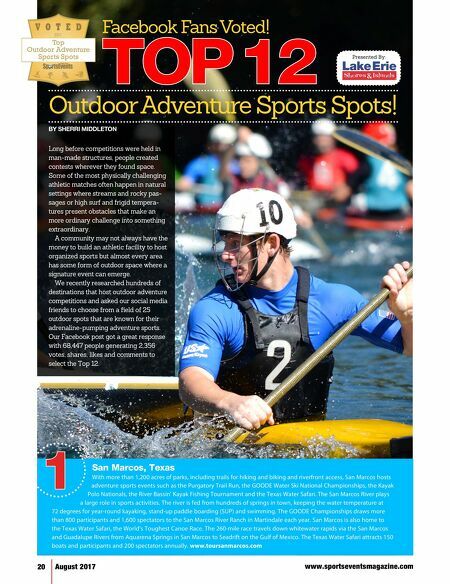 www.toursanmarcos.com 1 Outdoor Adventure Sports Spots! BY SHERRI MIDDLETON Presented By: Facebook Fans Voted!